…1. 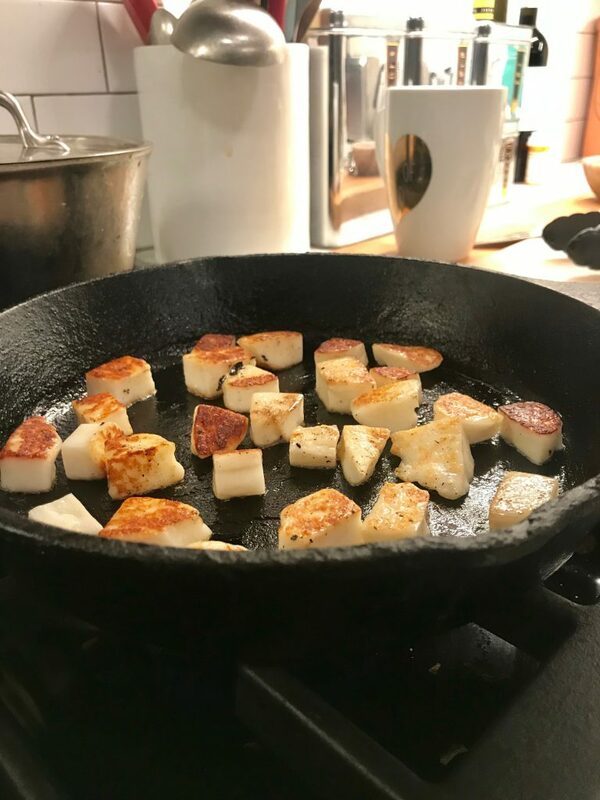 Halloumi! It’s cheese, so it’s not exactly good for you, but if you cut it into cubes, then fry it for a few seconds in a cast-iron pan (or a very lightly greased skillet) it’s just enough of a substantive hit that upgrades in a regular old salad (above, paired with butternut squash, almonds, an herby-yogurt dressing I’m completely blanking on) or a dutifully green Buddha bowl. (Recipe for that one coming soon.) Look for halloumi in better supermarkets near the feta and cotija. 2. Cauliflower, Reimagined Dan Barber blew everyone’s mind a few years ago when he reinterpreted a head of cauliflower as a “steak” and served it over cauliflower puree. Perhaps that’s why it seems like everywhere I look these days, clever types are now seeing the cruciferous vegetable as something it decidedly isn’t, i.e meat (Cauliflower Bolognese, above); or chicken ( Cauliflower Parm); or pasta (Cauliflower and Cheese). I do like where this is headed. 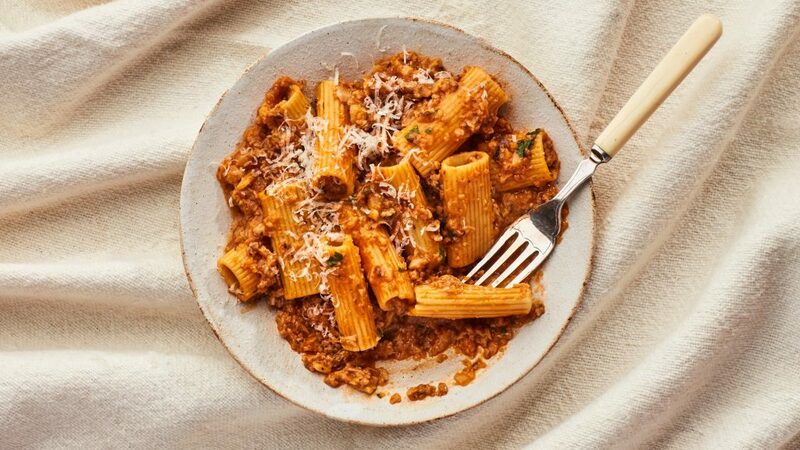 Photo of “Bolognese” for Bon Appetit by Chelsea Kyle. 4. Bob’s Red Mill Muesli Ever since Andy returned from a business trip in Germany three years ago, he’s been on a search to replicate the muesli he ate every morning in his hotel lobby. If we are to believe him, there’s nothing close to it Stateside. When he makes declarations like this, of course my first instinct is to prove him wrong. To that end, I’ve picked up bags of it everywhere from Ikea to little boutique food shops in the Hudson Valley with no success. I even tried a homemade version for Valentine’s Day one year, tying up the Mason jar with a red ribbon. He was polite about it, but that jar sat on the counter for months, virtually untouched, before I finally tossed the concoction and accepted defeat. 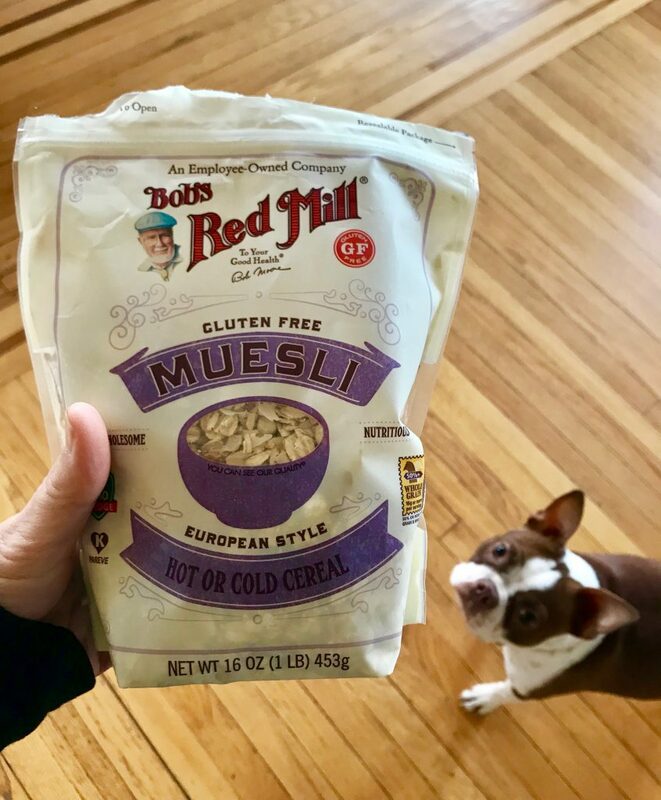 Then just last week, I grabbed a pouch of the gluten-free muesli from the Bob’s Red Mill display at a local supermarket. (There’s no specific reason why I picked gluten-free over the other options.) While I was traveling over the weekend, he texted me a photo of his breakfast. “I’ve had it twice this weekend. So good!” #smallvictories #marriage #problemsolved #niceproblems #HiBean! 5. Samin Nosrat’s Buttermilk Chicken. Anyone who’s already watched Nosrat’s Netflix series Salt, Fat, Acid, Heat, knows about her instant-icon chicken, which requires precisely three ingredients: A 3-4 lb. whole chicken, 2 cups of buttermilk, and salt. “If you’ve never roasted a chicken, this is the perfect place to start,” Nosrat says. The buttermilk provides the acid and the fat, tenderizes the meat, and offers the most “delicious kind of insurance” if you cook it five or ten minutes too long. We made the magical chicken within days of watching her prepare it and I urge you to do the same — it couldn’t be easier or tastier. Your story about Phoebe’s kettle is playing out in our house as well! We have a freshman in high school who decided to use Christmas gift cards to buy an electric kettle, tea cups, spoons and tea. I joke that she’s prepping for college dorm life someday! I’m interested in muesli as a breakfast option but it just seems so…plain. What do you DO to it to make it more palatable? Do you usually buy muesli with dried fruit in it? this one has dried cranberries, dried apples, coconut, and a bunch of nuts and seeds. I don’t find it bland, but like Emily said below, it’s not for everybody. Bircher Muesli! I used to live in Switzerland and often replicate the bircher muesli I had there using bob’s red mill muesli — grate an apple into 2 cups or so of muesli, squeeze in some lemon juice, add whatever dried fruits you like or that come with the muesli, mix with 1 c of milk + 1 c of yogurt and squeeze in the juice of about half of a lemon, depending on how tart you like things. Let sit overnight and eat cold the next morning, preferably topped with fresh berries. It is just the loveliest. This is one of the rare moments that I get to feel smug about British cuisine. 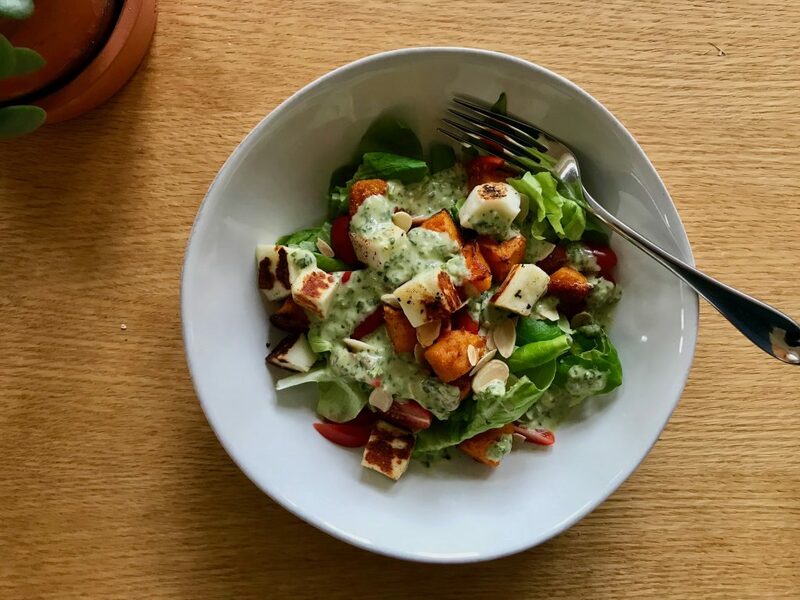 Halloumi is pretty much a corner shop staple here thanks to our Cypriot population, so halloumi has been rescuing bleak dinner situations since I was an undergraduate. Cauliflower cheese was my favorite part of the Sunday lunch meal when visiting my in-laws in England. Years later I asked my mother-in-law for her recipe, and was mortified when she pulled out a canister of powdered cheese. Cece! As a fellow Brit I thought exactly the same about cauliflower-cheese and halloumi . Haha Sarah yes! My brother in law in DC asked for an electric kettle from us for Christmas – and I was like ‘really?! That’s your gift of choice?’ But yep. To be fair we asked for new steak knives so both brothers clearly love themselves some kitchen time. An Aussie chiming in – haloumi is everywhere here! I always have it in my fridge – best thing ever. Electric kettle? Used multiple times daily. Cauliflower cheese – yes and yes. Muesli for breakfast – standard operating procedure in Australia! An interesting reminder of how different the food in the US is to ours sometimes! Um, I also asked for and received an electric kettle for Christmas – a pretty floral Pioneer Woman brand kettle. 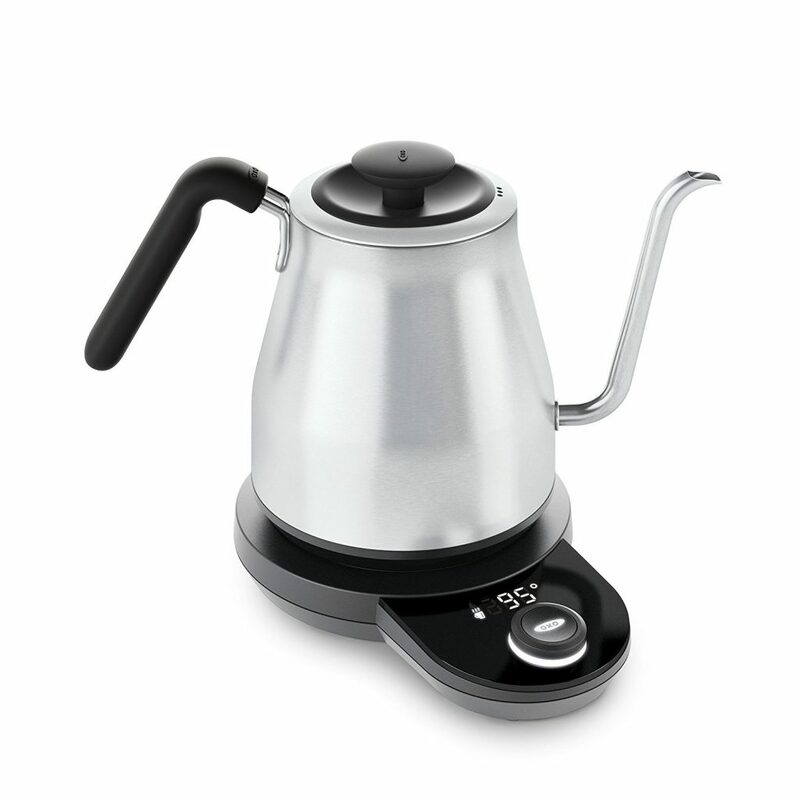 I’ve used stove tea kettle for years but decided an electric one would be more efficient. I make 2-3 pitchers of iced tea a week. I understand Andy 150%. I first had museli in Switzerland as a teenager, and have spent the ensuing decades desperate to recreate the magic of those simple hotel-buffet tureens. Alpen has been “good enough” for me, and sometimes I’ll mix in yogurt (a concoction my husband calls “wallpaper paste”) but I’ve sort of given up on anything so good as they make over there! Dang! i just roasted a chicken sunday AND happened to have buttermilk on-hand. wish i had marinated it. Next time for sure, especially since buttermilk has become a staple for my son’s pancake habit. I’m stepping AWAY from that oxo pour-over kettle as we currently have 4 different coffee appliances. enough! Do you think this would work with a turkey? We have an extra one in the freezer and this seems like a easy and delicious way to cook it. I don’t have a lot of experience cooking whole birds. Thanks. Yes! We cooked our christmas turkey using her buttermilk soaking method. We decided that will be the way we do it from now on. When it gets warmer you have to grill the haloumi with pineapple! A great combo. In our house it’s called squeaky cheese, because of the distinctive squeak when you bite into it. Thanks for all the inspiration! The Müsli from IKEA is made completely in Germany, and it is equal to a typical German package. Perhaps a little more sweet, but not far. I made my own Müsli before moving to Germany. I’d just pour raw oats in a bowl with cinnamon, fresh or dried fruit and nuts, and a milk of choice. Closest I got to it. The more raw, the more genuine it tasted. Yes, who would have known! Also, there are SO many variations that people fight about. For example, I hate raisins and other dried fruit in mine, but others love it. Some soak it overnight (more Bircher-like), some like it crunchy. Anyway- I love your inspiration and love figuring out so many things together with you and the other readers, thanks for that! My favorite roasts are part of his Terroir (single-estate) line. Mamuto, although a bit pricey at the moment, is my absolute favorite. Jenny, I”m a longtime fan of your blog, and love reading about your family and cooking your lovely recipes. I love some toasted almond slices on top! I now live in Australia and miss being able to order boxes of it! I love that your family is enthusiastic about food in their own specific ways with the pour over coffee and museli! I’m a big fan of both myself, although i make my own museli and like it cold for breakfast in the summer. I’ve been a big coffee lover since high school myself, my dad drinks coffee and there’s absolutely a soothing ritual to grinding the beans and their aroma through the finished mug. I’ve tried a lot of different preparations through the years and a good pourover is really hard to beat.